By now you have probably heard that a daily cardio workout can burn calories and help exercise your heart, but what you may not know is that a 40-minute spin class can burn up to 500 calories, offers a full-body workout, and helps strengthen your core and improve your cardiovascular health. Plus, you will firm calves, hamstrings, and thighs in no time, so let’s get moving as we check out the top spin classes in Rhode Island. For comprehensive health and fitness in a welcoming, enjoyable atmosphere, there’s none better than Bridge to Fitness. Plus, there are numerous group exercise and spinning classes throughout the day, as well as changing rooms, lockers, and stalled showering facilities. And, with an annual membership, all of this is available free of charge. Offering a dry sauna, lounge, and award-winning locker rooms, VP Fitness is a professional boutique fitness club that caters to professionals and serious fitness clients. Designed to meet demanding lifestyles and fast-paced work environments, programs at VP Fitness include a spinning that promises “the best riding experience in Providence," Pilates, defensive boxing, and more. 426 Fitness is a health and fitness facility that promotes an open and upbeat atmosphere and provide a motivating environment for members of all levels. You will find a spin studio, personal trainers, Fit-Tek, a Row Studio, and even a "Ladies Only" workout room. Plus, with over 40 classes a week 426 offers classes per week, you can choose from Yoga, Spinning, Pilates, Kettlebells, Rowing, or TRX training. This state-of-the-art workout facility offers more than 120 pieces of top-notch equipment including machines from Life Fitness, Cybex, Life Strength, Iron Grip, and Bodymasters. Plus, at Luxe you’ll find an array of classes, like spinning, Zumba, yoga, Pilates, and so many others. Moreover, there are personal trainers present every day, a daycare, and tanning options. Promoting the long-term health, Healthtrax helps you and your family enjoy a lifetime of wellness and unlike so many modern fitness locations, this gym supports a family-oriented environment, allowing everyone to exercise at their own pace. Plus you’ll never feel intimidated or overwhelmed and cycling classes are featured multiple times per month. With a philosophy that “fitness should be fun and hassle-free," Westerly Fitness was opened by Dion Luzzi in October of 2012. Amenities include a vitamin and wellness shop, as well as an on-site spa, and you will find classes like yoga, Pump & Pedal, Zumba, Booty Camp, HIIT, Urban Kick, and more. We all know the Y is a community-focused nonprofit, providing recreational programs and services for all ages, but did you know YMCA was established in 1844? Plus, Ocean Community YMCA has a healthy presence in the Ocean State and promotes youth development, healthy living, and social responsibility. Not only that, but you find an ice rink, pools, intramural sports, spin classes, and so much more at your local Y. With three spin classes every other week, Next Level Fitness can definitely get your motor running. Plus, the staff is supportive, experienced, and results-oriented, which mean they will help you attain your fitness goals on your time-table. And, you will find nutritional assessment, menu planning, pre-hab training, performance enhancement, corrective training, and down-to-earth exercise equipment. 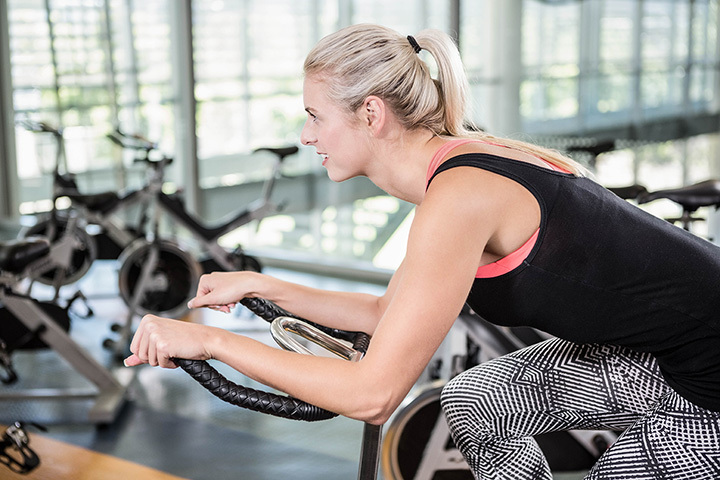 SpinWorks is all about spinning, and whether you are talking about intensive one-on-one sessions or group VR spinning sessions, it's your ride, and you control the incline and intensity of your bike. In addition to cardio classes, you will find total body conditioning classes and TRX resistance training. At Cycology your first class is free, and you can even find complimentary shoe rentals if you do not have the proper spinning shoes. There is a free towel service and a filtered water dispenser so that you can stay dry and hydrated. Moreover, a trained Cycology staff member will correctly set up your bike before you begin.